Well…hell, it’s been about five years. I’ll have a little more to say on that subject further down the page, but for now, the music – and why not make it special? I wouldn’t be surprised if a significant number of readers of Excavated Shellac were familiar with the incredible Kenyan recording of “Chemirocha,” which was captured by the South African ethnographer and recordist Hugh Tracey on his 1950 expedition across East Africa. If ever there was an early recording from Africa that could be described as infamous, “Chemirocha” is it. Decades ago, that recording was issued by Tracey on his long out-of-print Music of Africa LP collection (#2: Kenya), then later by John Storm Roberts on his groundbreaking and long out-of-print Nairobi Sound LP, and later, sounding clear as a bell, on the recent SWP Records CD Kenyan Songs and Strings. “Chemirocha” is deservedly infamous because of it’s backstory. Tracey arrived in Kapkatet, Kenya, inland from the eastern shore of Lake Victoria, to record the music of the Kipsigis. The Kipsigis were then known (and it seems still are) as a pastoral people whose livelihood, on the whole, depended on cattle, tea, and millet. Their language, interestingly, is not a Bantu language, and is part of the Nilotic language group, centered around southern Sudan, Kenya, and Uganda (Luo is also a Nilotic language). Anyway, Tracey discovered on his apparently rainy visit that the Kipsigis had heard numerous recordings by American country music star Jimmie Rodgers – likely purchased and/or brought to Kenya by the British, as Jimmie Rodgers discs were reissued in Britain on the Zonophone label. The Kipsigis, after hearing Rodgers’ music, were, according to Tracey, fascinated by his voice, which they deemed magical, and created a legend around him, calling him Chemirocha: Chemi (Jimmie) Rocha (Rodgers). 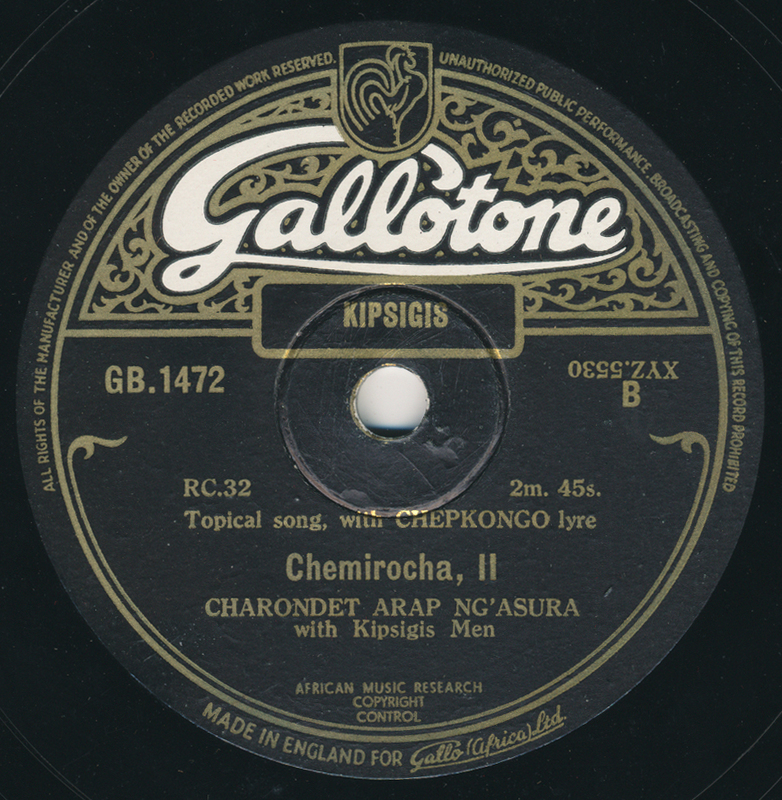 According to the Kipsigis, Chemirocha, because of his prowess as a singer and player, had to have been half-man, half-antelope. The younger Kipsigis invented songs about him. This well known and beautiful version of “Chemirocha” can be heard, introduced by Hugh Tracey himself, here. However, that was not the only song about Chemirocha that Tracey recorded. In fact, he recorded THREE Chemirocha songs – and the famous one described above technically was known in Tracey’s archive as “Chemirocha III.” They are all slightly different. This version, far less known and sung by young men, is “Chemirocha II,” and is slower, and more methodical. Tracey wrote in his notes that the other two versions of Chemirocha tunes were in fact songs usually performed by women, but the young men clearly knew them well enough to perform them, despite the embarrassment of their sisters, who were reticent to perform themselves. They are accompanied, as usual, by the 6-string bowl lyre of the Kipsigis known as the chepkongo (also chepkong, chemonge, or sometimes bukandit). In fact, the lyrics to this track are about the chepkongo, and how Chemirocha’s guitar playing sounds so similar to their own instrument. The instrument is used for both entertainment and ceremonial purposes. According to one source, in 1952 chepkongo songs by the Kipsigis were banned by the colonial-era Nandi African District Council. These songs have continued to marvel, probably due to the fact that the two main elements, the Kipsigis and the American country star, seem incongruous to most. Their music in theory appears incompatible. Yet, despite distance and difference of culture, and with help from the rampant dispersal of the gramophone record, one influenced the other. Of course, it’s far more complicated than that. Quite possibly, the devastating effects of colonialism played a part in bringing those Jimmie Rodgers records to Kenya. As Barry Mazor points out in his book “Meeting Jimmie Rodgers,” some patronizing hyperbole abounds in the writing on these recordings – one source I came across stated that the Kipsigis developed a “Jimmie Rodgers cult.” This appears to be, at best, an extreme exaggeration. Mazor, referencing Tracey’s notes, states that the name “Chemirocha,” from the Kipsigis standpoint, stood for anything new and different that came from outside of their country. Further, according to Tracey’s notes, the singers of “Chemirocha I” ask why their country has been taken over by white men. That, in itself, is a tip-off that we’re not talking about a Jimmie Rodgers personality cult. The Kipsigis were fascinated by the quality of Rodgers’ voice and playing – not his personality, his career as a country music star, or his lyrics, which they could not understand. At any rate, Hugh Tracey loved the region and was impressed by the Kipsigis, and for that we can be thankful. It should be mentioned that many of Tracey’s recordings can be accessed, via cooperation from Tracey’s ILAM (International Library of African Music), on the South African Music Archive Project website. The samples are low-resolution, stereo, and often poorly transferred, with sometimes incomplete or incorrect metadata – but still, it’s a phenomenal wealth of important content for researchers that deserves far more than lip service on a blog. I could find nothing about the duo of Joash Makaya and Joseph Sambili, members of the Luhya people of Western Kenya. Which one of them is providing the guitar, soda bottle, and vocals, is unknown – conceivably it could be just one of them. 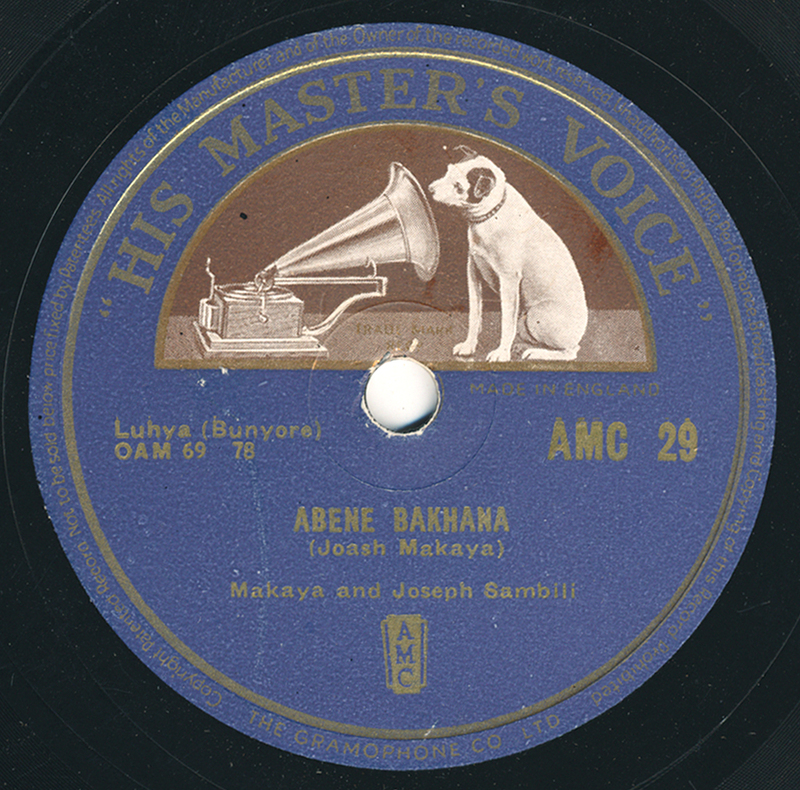 But Makaya was the writer of this piece, which was likely recorded in Nairobi in the summer of 1956. I discuss this a little in the notes to Opika Pende, but this entire series was funded by the African Mercantile Company (the “AMC” on the label), and organized by a British ex-patriot named Peter Colmore, a gregarious entrepreneur based in Nairobi. Every disc I’ve heard on this rare series has been terrific. Makaya and Sambili take a little while to get into a groove (indicating yet again that there was no time for second takes with most 78 recording), but then glide smoothly into beautiful singing and playing. So…five years of Excavated Shellac. Admittedly, the last few have been erratic in terms of posting, I realize. And who celebrates the anniversary of a website, anyway? I had an entire screed written, filled with complaints, anecdotes, opinions on blogging, opinions on collecting, the meaning of why on Earth I continue to do this…but I erased it. Ultimately, the meaning of why I do this is tied to the experience of listening and meeting people for whom this music (as opposed to merely the records) generates a response. It is entirely personal. Through it, I’ve met some generous people, incredibly knowledgeable contributors, and have had the lucky chance to release work publicly. I’ll keep updating Excavated Shellac so long as it continues to modestly make attempts to bridge a gap between ad-free interactive scholarship and entertainment. While the transfers have, and the writing has, I believe, improved over the years, I’ve kept to the same format and design. It’s a less-is-more approach…although with Opika Pende and Strings the amount of music released under the Excavated Shellac rubric has approached the 11-CD boxed set range, so the “more” part of “less-is-more” might be winning that battle. While it’s pretty easy to figure out who I am, at least on this website I will only be ‘JW,’ your (vaguely) anonymous moderator. And my one plug will be that if you have enjoyed these 150+ tracks on this website and have appreciated the commentary, please support my analog releases. You will not be disappointed. *Tracey, Hugh. (1951). Recording Tour, May to November 1950 East Africa. Newsletter. African Music Society, 1(4), 38-51. Happy anniversary and thank you for keeping on. It’s a sin that such incredible music has been practically forgotten. Thanks, Sam. I appreciate that. But it’s probably presumptuous to say that any of this music is forgotten, even practically. Over and over I have been made aware that there are people in countries all over the world who understand these musics, are familiar with the recording history of their country or region, and in some cases personally have known the artists themselves. Collectors are all over the world, in places you may not expect, documenting history. What is new, however, and what will change awareness, is the ability to access these recordings more readily. An awesome achievement…Here’s to the next five! thanks for sharing all these treasures and their stories!! Joyeux anniversaire ! And good luck for the next 5 years ! Dear JW (!) Congratulations! Dear ES Happy Birthday! Congratulations on the mini-jubilee. I wonder where digital music will be in another 5 years, let alone 78s! Keep up the great work + many thanks. Five years of work to treasure, JW! Congratulations – it’s very much appreciated. And thanks as always for these great new posts, both beautiful and utterly extraordinary. I first heard about Chemirocha from the English folklorist and singer A.L.Lloyd, in about 1980. He was a great storyteller, and at first I think we assumed it was another of his tall tales, but it became apparent that he was quite serious about this one, although I wouldn’t be at all surprised if he was embellishing it. He finished by singing the song – I’d like to say in perfect Kipsigi, but how would I know? Congratulations! If anything, you’re raising your own standard with these two. All best wishes for the incredible job you are doing.May God bless you to do everything you wished to do for the benefit of world music lovers.From the time a year back or so i happened to visit this site in search of Indian music and later enjoyed a lot all the world music you provided.Indebted to you a lot. Thanks very much for the support, all! Five more years! Five more years! Five more years! Every time I visit your blog, I am in awe of the work you do. Not only is the music wonderful to listen to, thanks to your transfers and to the choices you make, but the background information is always so impressive. Happy anniversary, and may we get to enjoy Excavated Shellac for many more years. Thanks for doing what you do. So many of these recordings have become reference points for me; songs that I couldn’t imagine not knowing. And to think how easily they could have been forgotten forever…. Just ordered Opika Pende, very excited for it to arrive! Also, could you put up a list of the songs that have been reposted? I figure out a few of them but I want to make sure I haven’t missed anything. thanks for sharing and the persistance in keeping the blog. This is a fabulous achievement. So humbling to see sonic creativity across the ages. You should get an award! Dear “JW”, first of all, I would like to congratulate your bolg. I’ve asked my self where am I that did not see your site. I’m a scholar, precisely, historian. Well, I’m a black historian from Brazil. Thus my field of research is African History. This year I began to make a radio program named “Africa Livre”, which means Africa Free. This project is an attempt to mix African History with African music. Each program has a theme that could be a region, empire, and so on. In these theme I choose four countries and their respective singers. I desire to make podcasts, but I can’t figure out how can I up load the podcasts. It will be possible to you give me some advice about how can I do t his thing? I would like to apologise for my broken english, I cant write really clear. I hope you could help me. been reading the Chimerocha story this morning, listenning to the ones available on the net (version III). Really touching story, transandental music, showing that music corsses over cultures and can be understood/assimilated by one another in different way. As a great fan of J.M.Hendrix & having the chance to live in specific part of Africa, like Kenya, Nigeria, a bit of Ethiopia, I heard severally in various locations pentatonic chords that -for someone of my generation- a identical to the ones used in blues. This is great! Does anyone know of a place where I can get the track with the original lead in explanation? I’m having a hard time finding it anywhere. Shouldn’t be too tough to either record it off of the YouTube link or better yet, track down the original LP. there’s been some interesting new info on this. If you go to Youtube and look up Singing Well. There’s a project run by the sound library Tracey established to find the sources. They return to the village and play the recording to the last living participant they could find, along with relatives of some of the others. They also get some good info on the meaning of ‘Chemirocha’ and the cultural context (fear of missionaries, fear of medical practices), along with some possibly more accurate interpretations of the lyrics than Tracey was able to give.